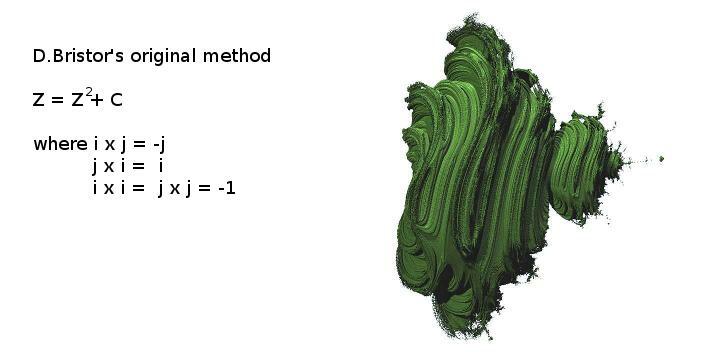 Here is a summary of some different 3D Mandelbrot set formulas for your convience. I have tried to include a second order and 8th order rendering for each formula presented here. Additional formulas are welcome. Hi Paul, you might want to try normalising that last one to 1 before multiplying by the magnitude - if the magnitude of the trig is zero then use (1,0,0) multiplied by the magnitude. Thanks for all these. That is the sort of summary I requested back in the original thread. This will really help others looking for formula info. Doug, I don't know enough math to follow that; could you turn it into a formula so I can see how new x,y,z values are created? These top two aren't a different formula, they're using the second method down in the posted list, but I don't think even powers are appropriate for this type as it makes the iteration discontinuous in space. Power 3 is my favourite, it would be interesting to get some more detailed shots of this. I'm fairly sure it is fully connected, and shows a lot of variety. These bottom two from the third formula down in the table. The iteration should be continuous in space at odd and even powers, its certainly a bizarre and interesting power 2 shape. Possible typo in the definitions at the top of this thread (image http://www.fractalforums.com/theory/summary-of-3d-mandelbrot-set-formulas/?action=dlattach;attach=524;image): r is defined as the nth power of the original vector length, and then the definition of phi uses r in the denominator. I think this value in the denominator should actually be the original vector length, not its nth power. Thanks for pointing that out. I made the correction. I am getting confused as to why I cannot reproduce the exact same shapes of 3D mandelbulbs when I plug above formulas into a voxel generator. I do apply the exact same iterative formulas in a spherical coordinates, yet the voxel representations of the bulbs look distinctly different (especially apparent for power 2). I am beginning to think that maybe a 3D raymarching approach based on Hubbard Duady does not really give the "correct" result. Could anyone verify this hypothesis or prove it wrong? Couple more formulae for you paul. (x,y,z)2 = ( ) left hand version. (x,y,z)2 = ( ) right hand version. Do you want the correct vx versions as well? They definitely don't strictly stick to the accepted Mandelbulb format, but they are all 3d fractals (not simply "regions inside level sets for 3d fractals" (quoted from an unnamed source, haven't asked permission to use their name) like the previous formulas I posted in the thread). Images are in the thread. As it is, some of them are pretty cool and have really neat fractal symmetry (I like Type B (not Mandelbulb B) the most). Zooming into the point (front) of type B higher order Z^8++ is pretty fun. If you think they are appropriate for this thread, go ahead an import them. May have a mod move them over here and put a link to this thread from that one.... or whatever.